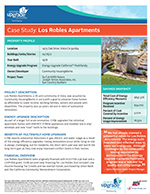 Through the Energy Upgrade California Multifamily program, Community HousingWorks completed a major rehabilitation of Los Robles Apartments, a 38-year old apartment development. Upgrades included dual pane, vinyl framed, high performance windows, new cool roofs and ENERGY STAR® refrigerators and dishwashers. SDG&E® offers Energy Upgrade California™ and Energy Efficiency Rebate programs to help you make energy efficiency improvements to your multifamily properties. Through a short phone call, we can qualify your property for rebates and incentives that will help increase property value, reduce operations and maintenance, and increase tenant comfort. Complete a property evaluation form or call us today at 916-844-0084 to get started.